Monday February 4th 1901 Mort went away this morning and Will was busy most of the day with the work, as he had so much snow to shovel. 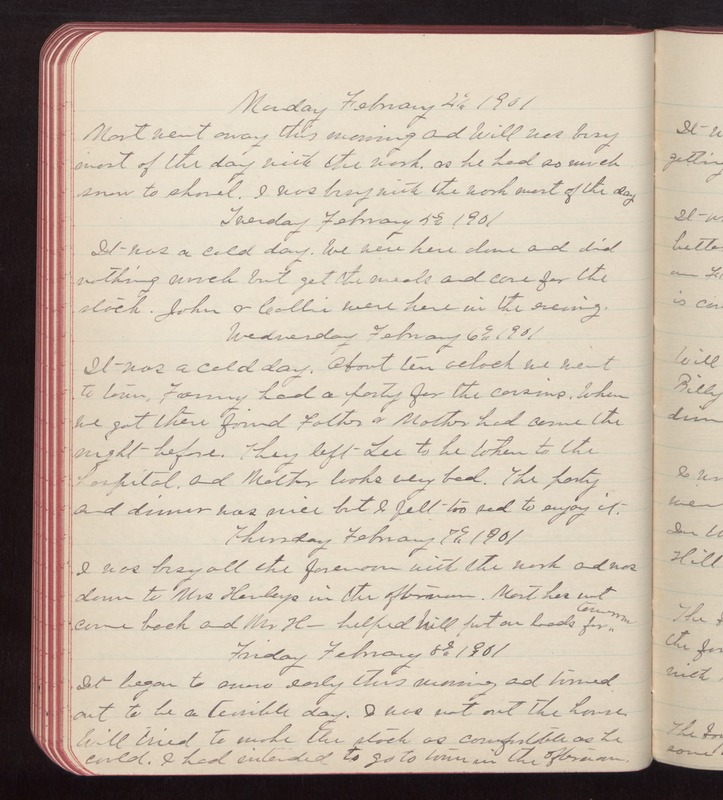 I was busy with the work most of the day Tuesday February 5th 1901 It was a cold day. We were here alone and did nothing much but get the meals and care for the stock. John & Callie were here in the evening. Wednesday February 6th 1901 It was a cold day. About ten oclock we went to town, Fanny had a party for the cousins. When we got there found Father & Mother had come the night before. They left Lee to the be taken to the hospital, and Mother looks very bad. The party and dinner was nice but I felt too sad to enjoy it. Thursday February 7th 1901 I was busy all the forenoon with the work and was down to Mrs Henleys in the afternoon. Mort has not come back and Mr H- helped Will put on loads for tomorrow Friday February 8th 1901 It began to snow early this morning and turned out to be a terrible day. I was not out the house. Will tried to make the stock as comfortable as he could. I had intended to go to town in the afternoon.